Earth Day 40 on the Fly . . .
Twenty years ago, while still an undergraduate journalism student at Penn State, I joined a lady friend on a spontaneous road trip to New York City to attend the 20th Earth Day concert held in Central Park. Twenty years later: same date, same place; but this time, as a permanent writer in residence, I took the subway and a day off from the West Village to spend Earth Day 40 fly fishing in Central Park. I began my morning along The Lake between 71st and 72nd Streets. 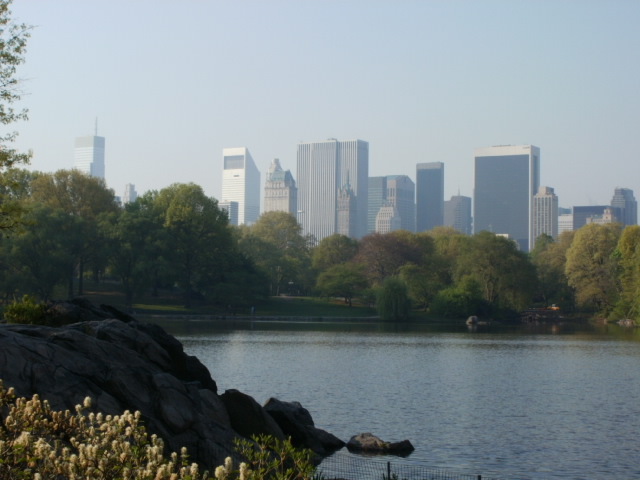 There I took some photos composed of the park in the foreground with midtown Manhattan rising in the distance. The contrast between spring green tree line and imposing skyscraper skyline made a fitting metaphor of balance for the holiday. New York in ecological balance on Earth Day 40. (Photo taken April 22, 2010). I caught and released a bluegill at The Lake; one fine fish for one fly fisher. Then passing crowds began to appear in earnest, so I packed up and hiked to Harlem Meer, an 11-acre pond located on the far northeastern corner of the park. During my walk through the hilly, forested section called The Ramble, I discovered one of the most revered American wildflowers – the white trillium (Trillium grandiflorum) – was in full bloom . . .
A white trillium (Trillium grandiflorum) blooms in a glade beside The Lake in Manhattan's Central Park. (photo taken April 22, 2010). This wildflower is beautiful, its bloom as graceful as it is grand, yet should never be picked. The three petals of the flower are supported by a symmetrical triad of leafy bracts, and these are the plant’s primary source of food generation via photosynthesis. Pick the flower, and the plant will rarely recover to bloom again. 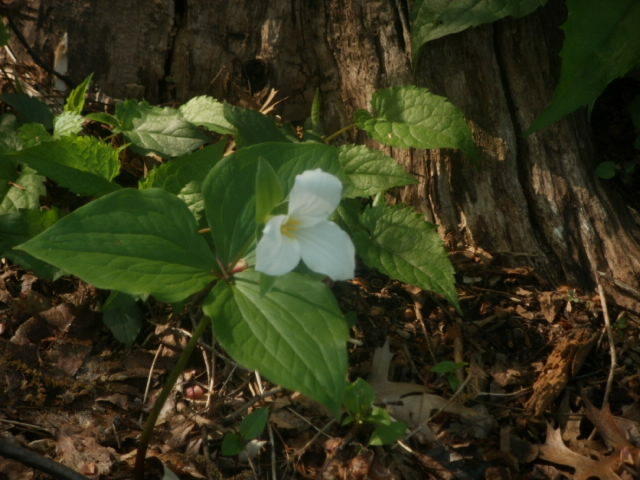 Humans should stick to photography if they want to keep a memory of this flower because it has another fan, one that can only be described as ravenous – the white-tailed deer, which favors the white trillium as a food item.